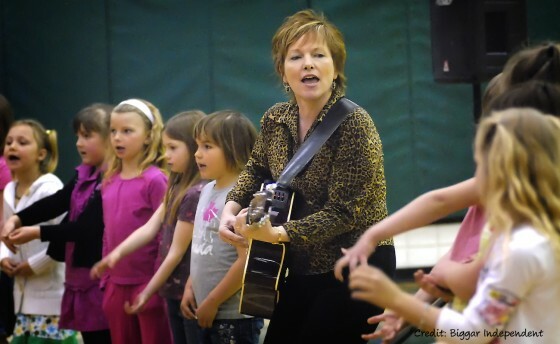 Besides performing at children’s festivals and other family events, Brenda appears regularly in Saskatchewan schools giving concerts, writing or reading presentations, and workshops about writing, songwriting, or performing. Below you’ll find descriptions of some of the great presentations Brenda offers in elementary schools. Usually she’s booked for a concert, with a reading or workshop in addition to the concert. For schools in Saskatoon, or close to the city, it may be possible for her to be booked for just a reading or workshop without a concert. Brenda is currently booking The Old Elephant’s Christmas for a tour in December of 2015. If you’d like a quote for a Brenda Baker event at your school, or if you require further information, please contact Brenda directly. You’ve gotta sing when the spirit says sing! …these are the lyrics Brenda Baker loves to perform when she begins her popular concerts for children. Her lively show is all about the simple pleasure of singing along with a varied repertoire that involves children in rhythm, rhyme, movement and playful language. As she seamlessly moves from song to song, Brenda’s unique ability to hold the attention of youngsters is second-to-none, and that ability has been tested in well over a thousand school performances! Brenda presents energetic, often humorous songs from her three terrific CDs for children. The songs are lyrically striking, with strong story lines or an interesting use of language. She involves kids on stage, inviting them to perform words and actions for their peers within minutes of learning the songs. Brenda requires a good sound system, and usually works from the floor in a gym or auditorium setting. Brenda gives great readings of her original work — stories and songs for the younger students, novel excerpts and short prose for the older ones. Her multimedia presentation includes excerpts from her albums and television work. She requires a DVD player, TV, and CD player. Depending on the size of the venue she may also require a sound system. Visit the Saskatchewan Writers Guild website for information on their school readings program. You can apply to receive a portion of Brenda’s reading fee and travel expenses from the Guild. Brenda gives writing or song writing workshops for students of all ages, and she’s been doing so since 1986. With the teacher’s input, the the workshop is designed to complement the curriculum. It can be one to two hours long, depending on what is to be accomplished, and if appropriate funding is available, Brenda can make return visits to a school if it’s in the Saskatoon area. Funding may be available through the SWG. Over the years Brenda has been an artist-in-residence for various schools. During the early 90′s she served Eastend School (two weeks full-time) and Fox Valley School Division (three weeks full-time). In 2005 she enjoyed a three-week residency at St. Michael School in Saskatoon. From 2000-07 she was the artist-in-residence for Saskatoon’s historic Marr Residence, the city’s oldest home still sitting on its original property. She provided arts-related programming in exchange for a writing studio space in the 1884 home that once served as a field hospital in the Riel Rebellion. For four months in 2009 Brenda was an artist-in-residence at Brunskill School in Saskatoon. To inquire about residencies, please contact Brenda directly. Brenda has given presentations at teacher conferences across the province. (Her Sing-Along Workshop has been the most popular request for these events.) She’s also available for in-service programs at schools. Thanks so much for yesterday….. you were awesome, …… and I know the group enjoyed it very much as well. I think the strategy you showed us of starting with a familiar song and organizing the syllable beat and stress structure is very worthwhile for students to get a start on the process. Please contact Brenda to discuss the details.